I’m going to guess that a lot of your money goes towards food, right? At least that is how it is in our household. We used to spend over $1,000 on food per month (the exact amount is a very high, scary number that I never want to think about again), and now we’re are at around $400 to $500 per month. We would like to cut it to around $350 per month. I also always hear others complaining about how expensive food is and how a lot of people almost ALWAYS go over their food budgets. Food can be very expensive, and unless you watch yourself and are careful, it can be very easy to go overboard. It is just too easy to buy expensive snack items and go to a restaurant and eat a $30 meal every day. There are many positives of watching your food budget. Saving money is of course number one! The amount that we spend on food is still high especially considering that there are only two of us, but we are still working on it. There are many things that we’ve done recently in order to really cut our food budget and notice a difference. 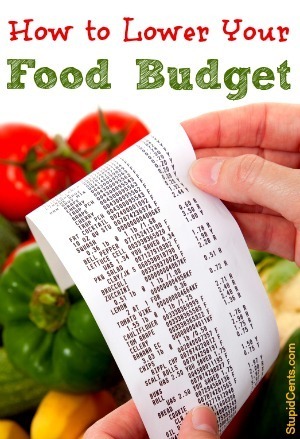 Want to know how to lower your food budget too? The main thing that was killing our budget was eating at restaurants way too much. We would eat out for breakfast, lunch and dinner. This was all attributable to us being lazy and not wanting to dedicate the small amount of free time that we had to cooking meals for ourselves. Ways that you can counteract being lazy is making meals ahead of time. Make your lunch for work the night before, and maybe try doing once-a-month batch cooking. Eating at home also has other positives, such as being able to enjoy family time more. With everyone eating around a table and not be bothered by waiters, hostesses, and other patrons, it is much of a comfortable environment. We put our “going out” budget into our food budget also, so that is another reason why it was so high. We went out to bars with friends way too much and it was too easy to spend $150 in one night. We would go out 3 or 4 times a week and buy rounds of drinks for everyone all of the time. Meal planning has definitely been a lifesaver. With meal planning, you just pick out the recipes and meals that you will make for the week (or maybe even 2 weeks out or even a month). This way you know the exact groceries that you need and will not buy any extras. You will cut down of waste from throwing away food, and if you know exactly what you will eat, there will be less of the dreaded “what will we eat tonight” discussions. It’s also nice because I try out more new recipes and meals for us now that I am constantly on the hunt for the next best recipe for us. What have you done to lower your food budget? If I followed step #2 more often, I could probably lower my food (entertainment) budget substantially. I have been known to spend $50 to $75 a night going out on the town, and then thinking the next day that I should have just saved the money. It was fun, but I could have the same amount of fun by drinking less and saving more.